The XS1200 is a step up from the older XS1000. This new 2nd generation XS1200 has a better processor and more features at only a slightly higher price. What you get is a better and more reliable design which can be used for more applications and devices. Get notified by email if a user Cold starts the converter, when there is an Authication failure, if the Local IP has changed or if the Password has changed. 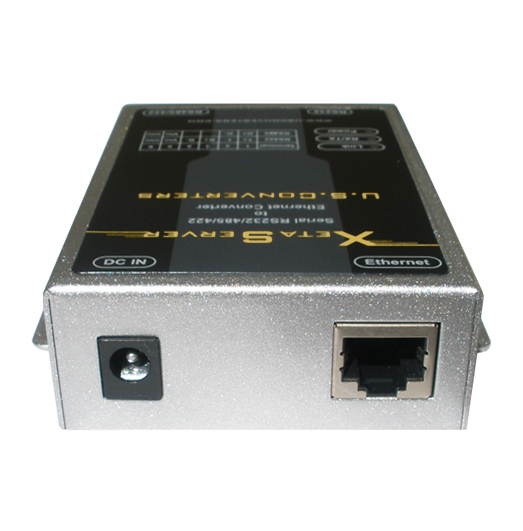 Allow only specified IP addresses to be able to connect to the XS1200. Baud rates up to 921600bps for RS485/RS422. The XS1200 is designed around an 8-bit AX11005 RISC processor from Asix, working at 100Mhz, which is an ideal low-cost solution offering reliable performance for most new and legacy serial devices and applications. 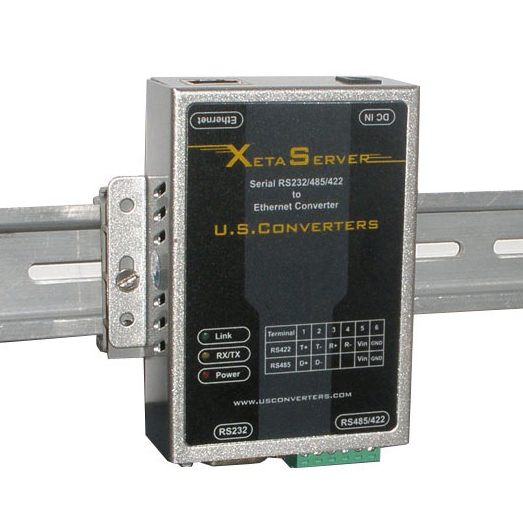 With this converter you can connect a serial RS232, RS485 or RS422 device to your computer over a standard Ethernet / LAN network and the downloadable virtual COM port software will create a virtual COM port in your operating system which can be used almost as if it was a native COM port. Notice that only one COM port will be created, which can be shared between the RS232, RS485 and RS422 interfaces; only one at a time. 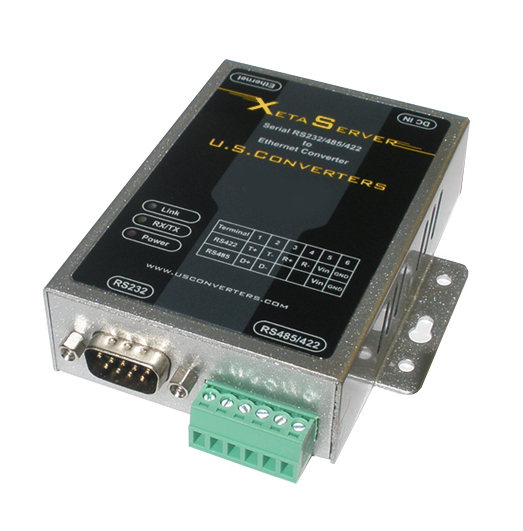 The XS1200 serial to Ethernet converter can be managed through a web-browser or the downloadable management software. Multiple COM port and network settings can be configured. It is good low-cost solution for most office, warehouse and factory environments including industries such as factory automation, alarm and security, laboratory and manufacturing. 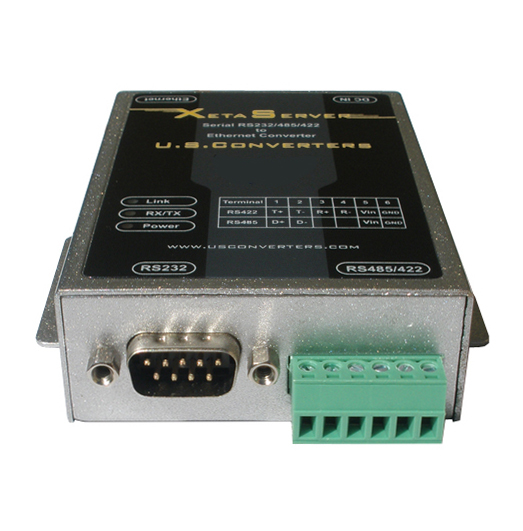 Ideal for connecting most serial devices such as CNC's, PLC's, printers, sensors, cameras, motor drives, scanners or any other standard RS232, RS485 or RS422 serial device. 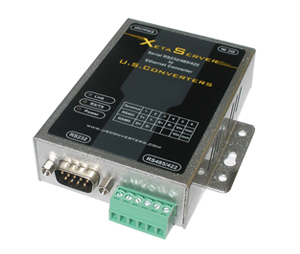 1-port RS232 / RS485 / RS422. Easy setup with included Virtual COM software. Connect serial devices over local LAN or Internet. DHCP (Dynamic Host Configuration Protocol) support.